ALIGN is a feature available on most NovAtel GNSS receivers that will determine the heading, pitch, and baseline length between two GNSS receivers. Cables to connect the receivers together and to your computer. The ALIGN Master receiver needs to be put in Moving Base Station mode and observation data will be sent out one of its serial ports. That observation data will then come in one of the serial ports on the ALIGN Rover receiver. 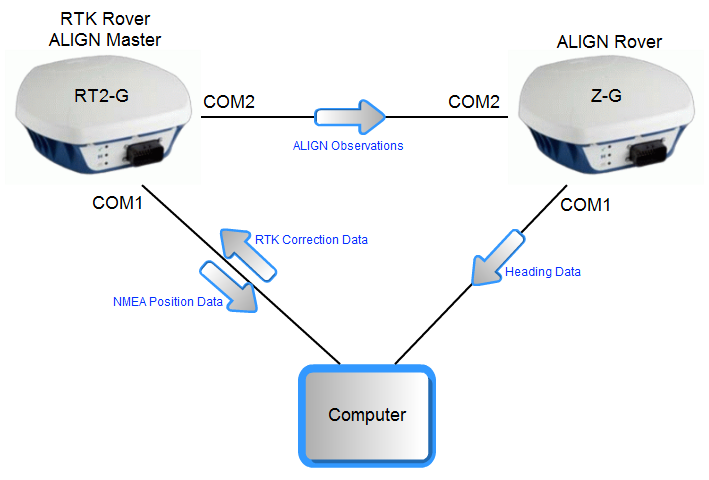 The ALIGN Rover will be configured to log a heading message every time it gets observation data from the ALIGN Master. The heading data reported by the ALIGN Rover will be relative to where the ALIGN Master is. If you also want position data (RTK or otherwise), you will get that from the ALIGN Master. The ALIGN Master will be doing two unrelated functions at the same time. RTK correction data can go to it and it will act as a RTK Rover, but it will also be generating moving base station data as an ALIGN Master. I used two NovAtel Smart-MR10 receivers to test this. The first receiver had the RT2-G unlock (RTK and GLONASS) and was functioning as a regular RTK rover receiver. RTK correction data was going in COM1, NMEA position data was coming out COM1, and the ALIGN observation data was coming out COM2. The second receiver had the Z-G unlock (ALIGN and GLONASS). It was receiving ALIGN observation data on COM2, and then HEADING data was coming out COM1. The COM1 port of each receiver was connected to a computer, and the COM2 ports of each receiver were connected together via a null-modem cable.